In 2015, ISU made it a goal to begin establishing partnerships with embassies in Norway. The objective of the partnerships is to improve the welfare of international students in Norway by providing information on the services offered by the embassies, and by informing the embassies of how they can assist their respective students. ISU has met with over 20 embassies in Oslo to discuss partnership opportunities. 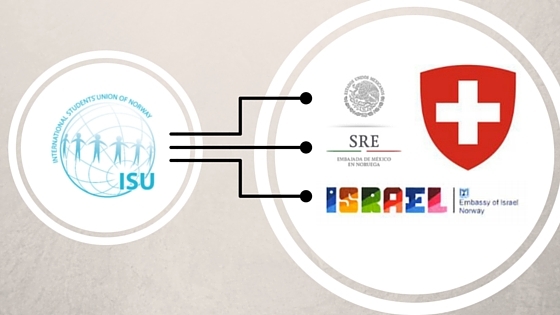 The partnerships are not political and are meant for the welfare of international students. Six embassies have shown great initiative in supporting their students: Mexico, Israel, Switzerland, Portugal, Morocco, and Brazil. The ambassadors of these countries have expressed interest in partnering with ISU to help their students. If you're an embassy interested in the initiative, or a student interested in how you can be involved, please contact Silje at nationalsecretary@isu-norway.no.